Below is a 3D model of the streamlined AVR Doper created in POV-Ray using Eagle3D. I only wanted to build an ISP so I was able to lose many of the components related to HVSP. I rounded the edges and scaled the board to fit in an Altoids tin. My simple inexpensive parallel ISP programmer below has done the job since I started working with AVR’s, but it definitely has its problems. 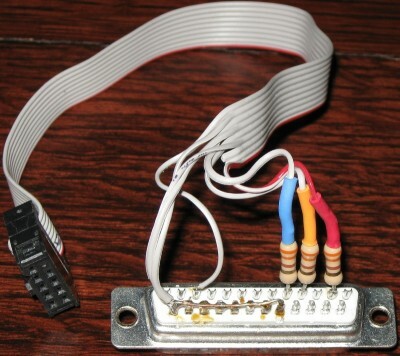 It doesn’t work with some computers, it is slow, it is unreliable and it requires a parallel port which is getting less common. 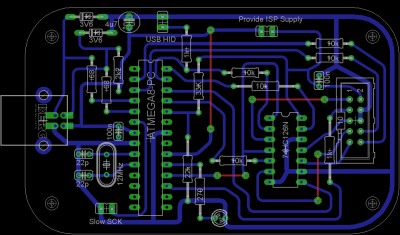 USB seemed the natural progression so I selected the AVR Doper project by Objective Development as the base for the new programmer. 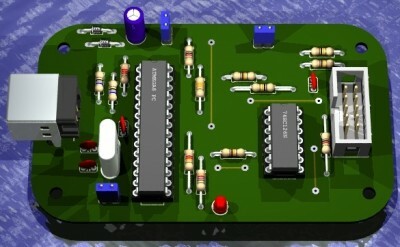 I modified the Objective Development schematics and circuit board using the free version of CadSoft Eagle. 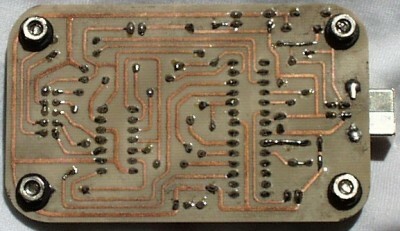 I designed the board to be single-sided but it does require 4 bridges. Here is the completed board. 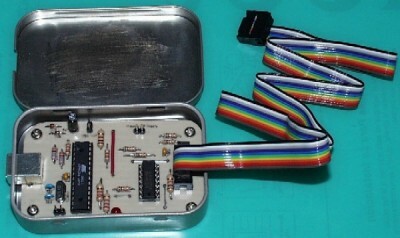 Here is a shot of the board mounted in the Altoids tin. 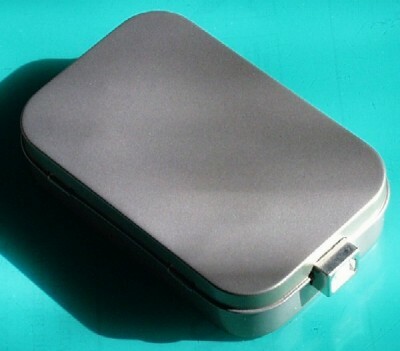 Next I powder coated the Altoids tin with a metallic silver finish. 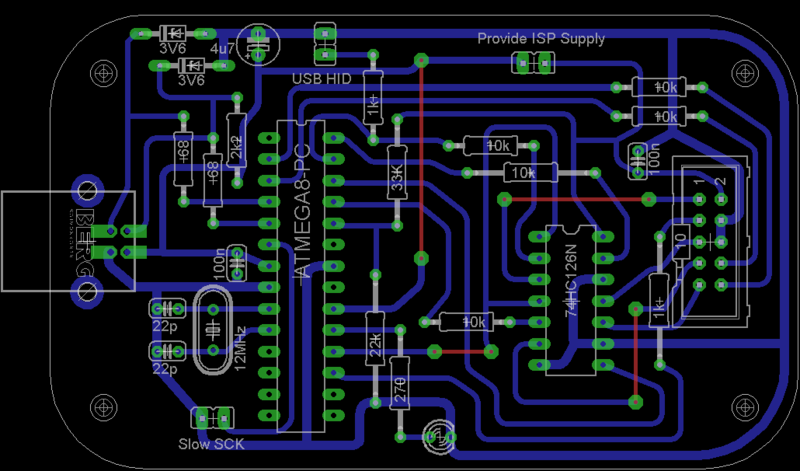 Here is the pinout for the 10 pin ISP header jack. The AVR .hex code, USB .inf driver and other info is available from the AVR Doper Project site. I have successfully tested the programmer with the 2008-11-27 firmware. Here are my upgrading notes. The USB programmer can be used to upgrade itself if you have a spare ATMega8 chip. Please read the before asking questions. 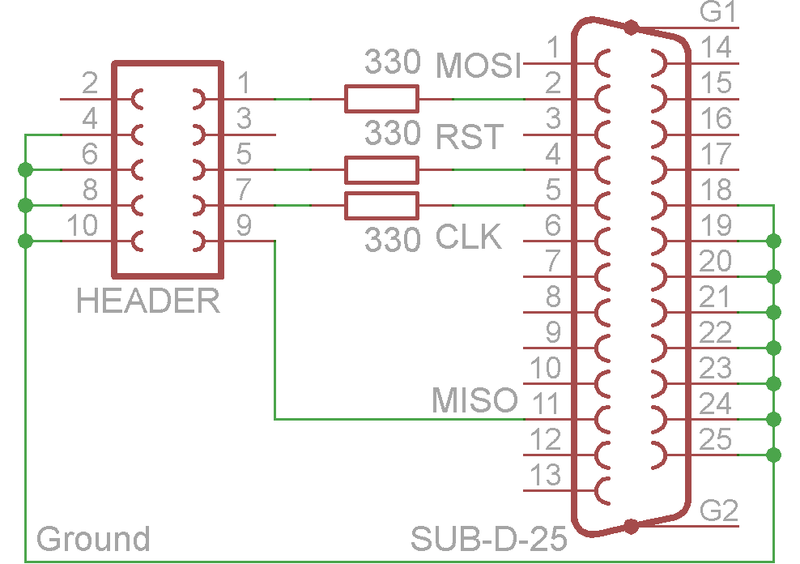 Note (from AVR Doper website): Implementing a USB CDC device with AVR-USB violates some aspects of USB 1.1. 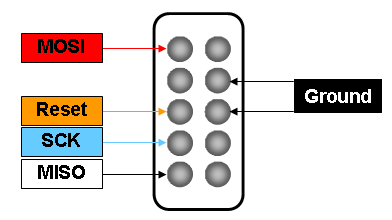 CDC-Mode may therefore fail or be unreliable on some operating systems or computer hardware. 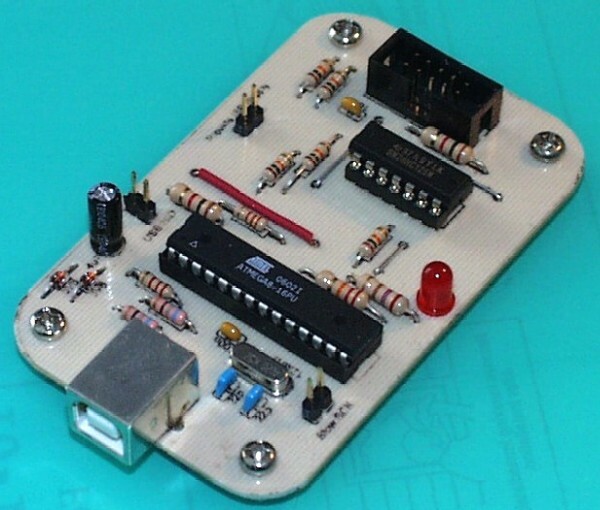 Please look at the compatibility list included in the AVR-CDC project or test a simplified prototype on breadboard with your computer if you want to use CDC mode.We recommend that you use AVR-Doper in HID mode instead, which has no such problem. This mode is supported by AVRDude. More information about interface modes and their relative advantages can be found in the project description. AVRDude 5.3.1 and higher now supports the AVR Doper programmer. 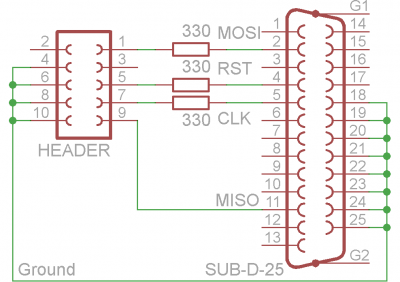 Also check out my tutorial on using a Raspberry Pi to program AVR chips. Streamlined AVR Doper Eagle files. 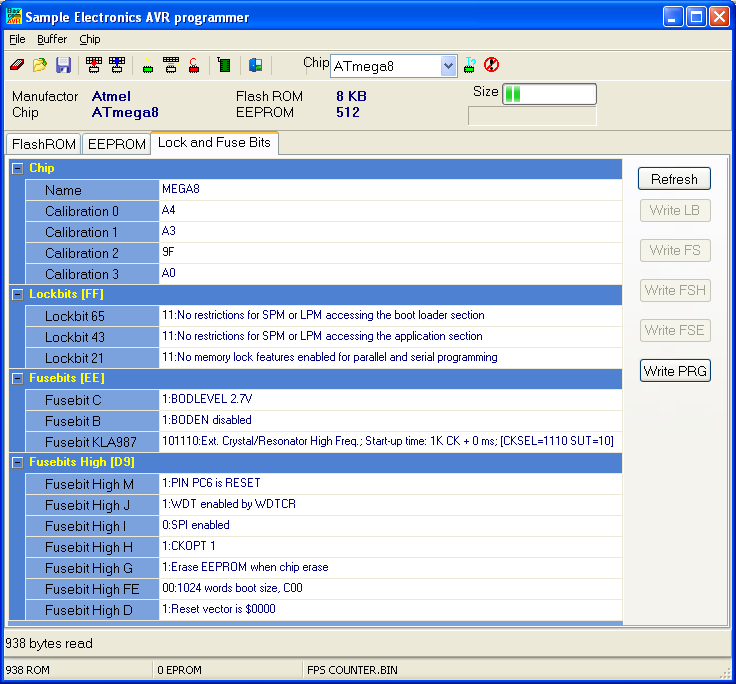 Slightly modified version of the 2008_11_27 AVR Doper firmware to bypass the upgrade warning in AVR Studio. The total cost of the project is about $12.